Voted the number one coffee roaster in Vancouver at the 2017 Snobby Awards, it’s easy to see why we use Pallet Coffee Roasters as our coffee supplier. At Mount Currie Coffee Company, we love to support local BC businesses (like us!) and Pallet seemed the obvious choice, with their exceptional coffees and close proximity to Whistler. Founded in Vancouver in 2014, Pallet roast all their own coffee in-house, so the quality you can expect from them is always next level. Coffee selection is a critical part of Pallet’s success and their approach is simple – look for the best beans to make exceptional tasting coffee. They source coffee from some of the most renowned growing regions in the world, with a focus on specialty green coffee. To ensure exceptional quality and taste, roast profiles are specially created to achieve the best flavour, aroma, body, acidity, sweetness, aftertaste and balance. With three of their own cafes becoming increasingly popular in Vancouver – at East Village, Kingsway & Kits – we urge you to check out one of Pallet’s coffee shops next time you’re in the city. You’ll find their cafés all offer a varied style and vibe, fitting perfectly into each different community, whilst still offering a consistent coffee experience. The main espresso bean used at Mount Currie Coffee Co in Whistler and Pemberton is Pallet’s ‘Benchmark’ bean – a rich blend of Brazillian and Colombia coffees. We’re big fans of this particular blend, we find it to be a crowd pleasing espresso that tastes great on its own or with milk – it’s approachable, well-balanced, and easy-to-drink coffee. Have a read below about the coffee beans we’re currently using. We’re always updating our beans to bring you new varietals and fresh crops, so stay tuned to the blog for future bean updates! 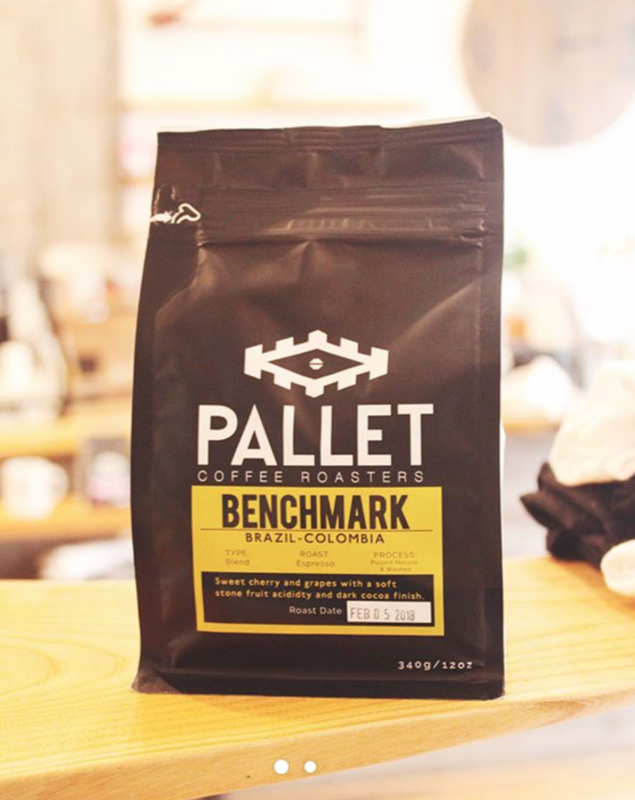 Pallet’s Benchmark blend is currently our main espresso bean at Mount Currie Coffee Co. With a pulped natural Brazil base to create medium-full body and deliver a smooth cocoa finish, Benchmark is blended with a sweet and fruit forward Colombia bean that produces a sweet, juicy tropical finish. All these qualities come together to deliver a well-balanced, always enjoyable cup! This blend has been developed specifically for Mount Currie Coffee Co, designed for those wanting the character of a dark roast – full bodied and low acidity – without being burnt. It’s an honest, easy drinking coffee and a great one to help open the eyes in the morning! The coffee is a blend of two beans – one from Brazil Fazenda Recreio, a family-run farm in São Sebastião da Grama, Brazil and the second, from El Salvador Buenos Aires – a Buenos Aires growing community located on the north face of the Santa Ana Volcano. We’re currently stocking Pallet’s Honduras Cooperativa RAOS, a tasty single-origin coffee made exclusively by a cooperative of 77 smallholder women coffee growers in Honduras. Cooperativa RAOS’s philosophy supports the development of training farms and integrated farm management programs, with a focus on helping to increase access to these programs to female coffee growers. We’re really excited about supporting women growers – many of our super-talented baristas in Whistler and Pemby are women, so supporting gender equality across the world is a massive bonus for us! We use two Ethiopia beans at Mount Currie Coffee Co. Grown at an altitude of 1900–2200 masl in Guji, Ethiopia, the Ethiopia Guji bean offers a mix of sweet berries with floral notes, citrus fruits and smooth chocolate. In contrast, the Ethiopia Kayon Mountain bean gives rise to blueberries with green apple acidity and subtle notes of bubblegum. We use Pallet’s Ethiopia Sidamo Decaf – made by the Swiss Water Decaf Company, this Ethiopian Sidamo is decaffienated with a gentle, 100% chemical-free process. Swiss Water® is the innovative craft of using pure water to gently remove caffeine in small batches, whilst not removing any of the original flavour. If you have any questions or comments about our coffee or Pallet, don’t hesitate to come and speak to one of our coffee-loving, fully-trained baristas at Mount Currie Coffee Company – Whistler & Pemberton.